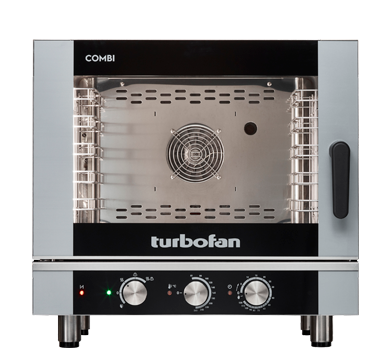 Dimensions W 32" x D 28-5/8" x H 46"
The Turbofan E40M10 combi incorporates straightforward simplicity with manual controls in a combi oven. With ten GN 1/1 tray capacity within its compact 812mm / 32″ wide footprint, place it in the open kitchen or tuck it away in the bar area and take your kitchen to a new degree of productivity. With easy to use electromechanical controls with controller knobs to set cooking mode between convection, steam or combination mode, time and temperature. Fitted with a hand shower providing a durable and effective quick clean tool.